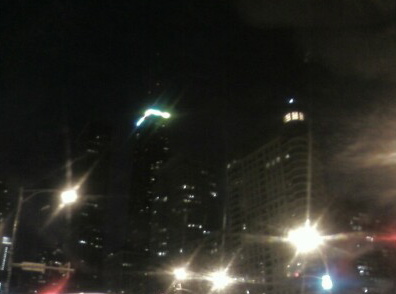 First of all, apologies for the atrocious photo above, snapped with my lousy camera phone while we were stopped at a traffic light on Lake Shore Drive. That hulking building with the band of glowing lights on top is the Hancock Building, decked out in Olympic splendor. Many of the more prominent buildings in Chicago change their decorative lighting for holidays (orange for Halloween, red-white-and-blue for Independence Day, Green for St. Patrick’s day) or special events. In this case, the Hancock and Wrigley Building are accented with the colors of the Olympic rings. In case you haven’t heard, Mayor Daley and a faction of civic leaders and Olympic boosters are falling all over themselves in an attempt to woo the International Olympic Committee to choose Chicago as the summer venue for the 2016 games. As if Chicago didn’t have enough money troubles. A few weeks ago, the fact that a neighborhood slotted to lose parkland to an Olympic stadium had jumped to the front of the pot hole-filling queue (in preparation for the IOC’s visit) shouldn’t have shocked anyone. That’s just the beginning of it, should Chicago win the games. The IOC arrives tomorrow for a six day visit to make their final evaluation. The Buckingham Fountain repairs, which have been going on all winter, have magically finished just in time for the visit and the scaffolding has all come down. Olympic banners line Grant Park and the Michigan Avenue Bridge, and the Smurfit-Stone building has a pair of 2016s outlined in lights in its diamond roof. For the next six days, everything in Chicago will halt and focus on the committee’s every move. If you couldn’t tell from my tone, I’m no fan of having the Olympics come to Chicago. I think it will be a financial disaster for Chicago taxpayers. Two words sum it up: Illinois politics. Two more words come to mind: Greed and ego. At the January 28 Park District board meeting, the commissioners wenteven further, unanimously adopting new leasing rules that give superintendent Tim Mitchell a free hand to let the Olympics use any of the parks without board approval or public hearings. This will let Mitchell and the bid committee shift venues and construction schedules without notifying the public. Scary. Like I said, it’s just the beginning. Personally, I hope the hype ends in October when the IOC chooses any other city over Chicago.